I'm not counting down - and not just because I don't like to wish my days away. We've got two more birthdays (with parties), a marimba performance and the big ballet production to go before I even start thinking about Christmas this year. 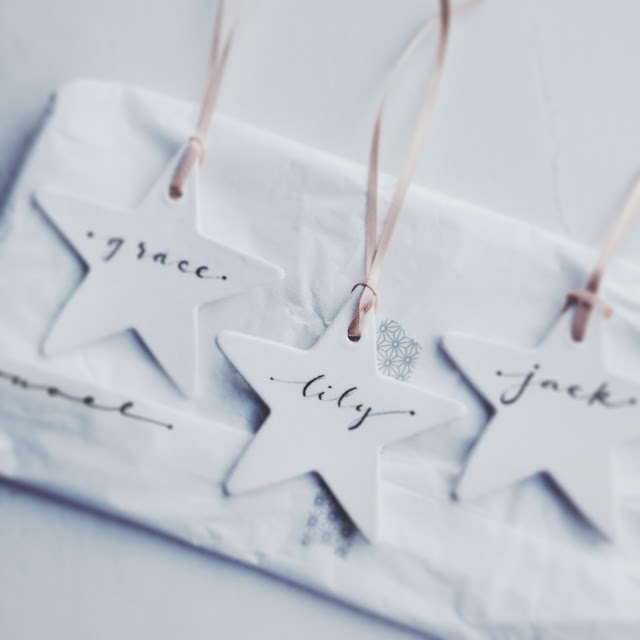 So apart from these to-die-for star ornaments (from the totally talented Ness over here) I'm ignoring Christmas for now. I'm sewing fur and sequins onto costumes, organising car pooling for gym and little athletics, dreaming up party themes and culling guest lists, helping with present choosing ... and putting my head down and walking straight past all those decorations/yummy food items/red, green everything that the shops are filling up with already. It has been mentioned in our house. I have been making jam and chutney this year for homemade gifts. But I refuse to get flustered about Christmas. I studiously ignore all the festive goodies in the shops (apart from some very cute cake decorations I bought in Morrisons yesterday. Ahem). Those decs above are lovely though. I have to admit to doing a bit of a countdown but mainly because I'm a teacher and I love my school holi's a little too much! I have started sewing up a few pressies and Sunny asks me every time we're at the shops if Christmas is tomorrow! If she keeps asking me that every second day for the next 8 weeks then I'm afraid I'll have to ban the word CHRISTMAS! P.S. Loving the look of those ornaments! I think that 8 weeks is far too early to begin the countdown.. those stars are beautiful though! I usually wait until my youngest's birthday is over which is this weekend and then start vaguely thinking about it. Then end up in a mad rushed, stressed heap by Christmas. Each year I vow it will be different. I hope it is this year. I will never be the type to have all shopping done before December, but i'd like to slowly easy into it all in a more sane fashion than usual. Hope the party planning is going well!!! Birthdays are just as fun as Christmas! Just started thinking about it today - being November and all! Have thought that I should probably get my kids some presents and think about decorating. We have a first birthday party on November 10. Getting through that first. I've started thinking about Christmas and have almost got my presents sorted. I started early because I wanted to make a lot of the pressies which has taken time.